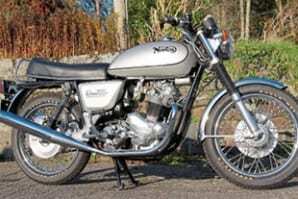 No Mileage Norton Commando for sale! The final batch of 25 bikes was released in 1977-78, but a tiny number of twins entered circulation even after then. The last officially documented new Commando was sold by Andover Norton for £2300 an entire five years after production ceased – presented to its new owner at a special ceremony by NVT man Mike Jackson and Grand Prix superstar Kenny Roberts. That bike even appears in Roy Bacon’s book, Norton Buyer’s Guide, with tuning guru Ray Petty astride it, outside the Andover Norton factory. That very Commando survives to this very day, still silver, still with almost zero miles on its clock, still brand new and still unregistered. The Commando has been moved so little in 33 years that its Goodyear Eagle tyres have even retained their original red chalk line intact. The machine just surfaced in Cornwall, where it’s been in the safe-keeping of the original purchaser, an enthusiast collector, ever since Ray Petty delivered it to him. What price an unused Commando? Previous Post:February TCM out now!